Pine Needles Bad for Our Gardens? If you live in a neighborhood where ponderosa pines grow freely, you know about too many pine needles. 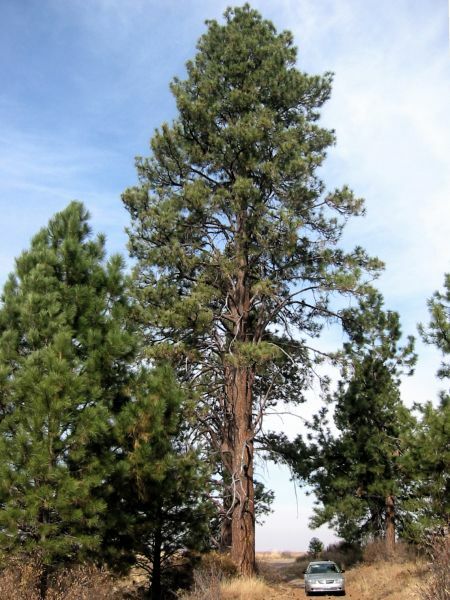 Pine trees drop lots of needles, especially those 50-foot giants! Gutter guards protect my rain gutters, but I still have piles of needles on the ground. What is to be done with all these needles??? Are pine needles good or bad for our gardens? After reading this column you just may want to strike a deal with a friend who owns several large pine trees. For years we’ve heard that pine needles should be used only around acid-loving plants. Since the needles themselves lean toward being acidic, it would seem to make sense that they acidify their surroundings. Right? Not true. Pine needles do not acidify garden soils. Many things, such as climate, rainfall, irrigation water, and the soil itself influence soil pH. However, top dressing, or mulched materials break down so slowly that they hardly make a difference to a soil’s pH. The acidity of pine needle mulch remains at the soil’s surface and does not alter the soil around plants’ roots. Are Pine Needles a Good Choice for Mulching? Pine needles are a good choice for mulching, and really economical if you have pine trees in your yard or pine straw easily available locally. Because pine needles break down so slowly they are not good additives to turn directly into garden soils. Best to use them as a top dressing on flower gardens, around roses, and places where weed and moisture control are desired. 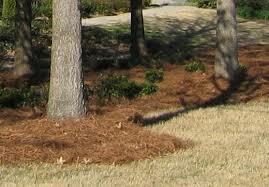 Pine straw is the name given to pine needles when they are used as top dressing mulch. Despite our local concentration of pine forests, rarely is pine straw offered for sale. But if you can get your hands on some, whether commercial product or your neighbor’s surplus, pine straw makes excellent and inexpensive mulch. Needles are lightweight. Not only are they easy on gardeners’ backs, they don’t compact soils. Pine needles rarely bring weed seed with them. Also, they block sunlight from reaching the seeds that are already in the soil, preventing them from germinating. Pine needles decompose very slowly, so that they don’t need replacing as often as other mulches. However, eventually needles will breakdown and enrich garden soil. They moderate soil temperature in summer and prevent winter soils from freezing and heaving roots from the ground. Once pine needles settle, very few float away in heavy rain. They form a loose mat and stay put. Pine straw is often recommended for slopes and hillsides. They allow irrigation and light rains to get through to the soil, rather than washing to the bottom of the slope and carrying away precious topsoil. Pine needles are a renewable resource. No trees are felled to collect needles; pine straw just happens. We all know that nothing is perfect, including pine straw mulch. I’ve already mentioned that availability can be a problem. When you do find pine straw, be aware that until a new layer of needles has settled it can be blown around in windy locations. If it does not cover the soil fully, you still will have some weeds, and weeding in pine straw is not particularly pleasant. It may look light and fluffy, but those needles are sharp! Pine straw is flammable. If you are in the Wildfire Interface, composted mulch or cedar bark products are better, safer choices. Using too much is a bad thing. Pines use their needles to smother out all competitors within their root zones. So, more than a 4” inch layer of needles creates an interlocking turtle shell effect that sheds water away from your plants. A 2-4” inch layer is ideal. No matter their drawbacks, I collect and use pine needles for my gardens. Use pine straw just like any other mulch. Spread it around trees and shrubs and use it to dress your garden beds. Just remember that a 2” layer settles down to a layer of about 1” inch. My experience recommends putting down a 4” layer of needles. Shake and toss pine straw the way you would regular straw, so it forms a fluffy layer. If you already have native pines and junipers on your property you know how thick the layers of needles can be. To reduce wildfire risk rake up the light fluffy layer of needles, but leave a 2-4” layer of needles around the trees’ drip lines. This will ensure that your trees remain moist, while reducing native weeds and infestations of bark beetles. Pine trees need some needles at their bases to protect their health. Give the rest away to friends and fellow gardeners in the neighborhood. Recommendation – If you are fearful of wildfires and just can’t leave an insulating layer of needles behind after cleanup, try using a 2-4” layer of shredded cedar bark or composted material instead. Composted material and bark products don’t burn as easily as pine straw. Use collected pine needles around fire- resistant plants like roses, lilacs, rhododendrons, azaleas, and distyliums. Until next week, I’ll see you at Watters Garden Center. Can I use pine needles in an ASPARAGUS bed? 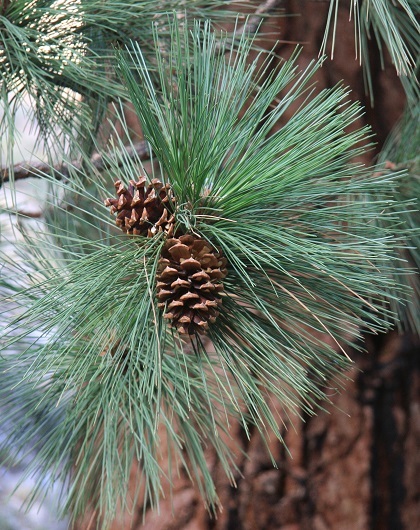 Is it okay to use green pine needles? A huge pine tree fell down and it is loaded with needles. I read about this and used pine needles to protect my new azalea plant for the winter. I have just pulled back the needles to the drip line to put down fertilizer at the drip line as the bag indicated. (I use Organic Holly-Tone and I live in St. Louis, MO) My question is do I put the needles back around the plant or get rid of it for the spring and summer? Thanks so much for any information.